What will Circular Space do that I can’t do myself? Where is Circular Space currently active? If I apply through this programme, am I committed to participate? Do I own the photographs? Can I embed these images on my business web site? When potential customers search for your business by name on Google, they will see the images displayed directly on the search results page. These panoramic images will also be published on Google+ Local pages, Google Maps and other Google properties and will give customers a better sense of the layout, decor and beauty of your business interior. Using easy-to-use html snippets or Maps APIs, you can also link to these images from your own business website, attracting potential customers who also visit your website. It’s a great way for customers to engage with your business. Google Trusted Photographers are taking high-quality still photographs that will be stitched into 360-degree views using panoramic camera technology. These Trusted Photographers are independent contractors who have been trained and certified by Google to produce high-quality panoramic images. As a business owner, you can also upload your own photographs to Google by signing in to Google+. You’ll be able to see the photos and 360-degree panoramic imagery directly in Google search results and on your Google+ Local page. Trusted Photographers are trained to take high-quality photos of building interiors, allowing for common challenges such as low lighting and tight spaces. The photographers are also certified to take pictures using fisheye lenses and rotating camera turrets (mounted on tripods) that, once uploaded to Google’s processing pipelines by photographers, will be transformed into 360-degree panoramic imagery and a walk-through of your business. Once photographers upload the pictures from their cameras, Google’s processing pipelines use sophisticated image stitching, HDR, image matching and other technologies to produce these panoramic walk-throughs. Trusted Photographers are scheduling photo shoots with business owners in a limited number of cities in the UK, U.S., Australia, New Zealand, France, Ireland, Netherlands and Canada. Even if we aren’t currently active in your area, you can always upload your own photos via Google+ Local. Yes! It’s great to see interest from around the world, and your requests will help us decide where to expand this program to next. At the present time, we are not photographing legal, medical, corporate, religious or large chain establishments. Trusted Photographers are independent contractors/businesses that are not employed by Google, agents of Google or affiliated with Google in any way. 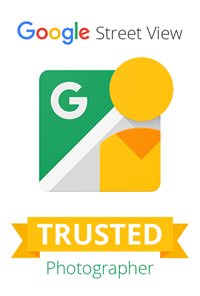 Google has certified them because they meet Google’s standards of quality for taking feature pictures and panoramic pictures, uploading them, moderating them and eventually publishing them on Google properties. Because Trusted Photographers are not employees or affiliated with Google, they decide how much to charge for their services. We expect the Trusted Photographers to offer their services at a fair market value, and you may negotiate with them to come to an acceptable price for the service. Prior to any photo shoot, the Trusted Photographers will present the Service Agreement, specifying their services, for your acceptance. The agreement also spells out (among other things) that, in return for your payment to the Trusted Photographer, you will own the images that have been taken. No. Once you apply, if and when a Trusted Photographer becomes available in your city, the Trusted Photographer will contact you to discuss details and receive confirmation from you before photographing your business. Contact us to schedule a photo shoot. If you are unable to schedule a photo shoot, or if there is no Trusted Photographer listed for your city, please fill out the online application. If a Trusted Photographer is unavailable or unresponsive, please give us your business and contact details on the Apply Now button. However, bear in mind that at the present time we’re offering Business Photos to a limited number of cities only and it may be a while before we can assist you. Thanks for your understanding. We know that you’re running a business, and that’s why we designed photo shoots to be as non-disruptive as possible. Trusted Photographers will work around your schedule to ensure that photos are taken at a convenient time for you and your business. Photo shoots do not require any sort of special equipment, lighting or setup, so you are free to stay open. Although photo shoots are non-disruptive and should not interfere with your normal business operations, it’s a good idea to let your customers know photography is in process and to avoid being in view of the camera, whenever possible. Because we want to keep the focus of the photos on the inside of your business, we aim to have as few people in the shots as possible. During the shoot, photographers may put up a sign and alert customers and employees about to be photographed. As the business owner, it would be your responsibility to notify your employees and customers that the photo shoot is taking place. Photo shoots will exclude any areas of your businesses which you would not like to feature. In addition, our photographers will always alert customers and employees before a photo is taken, to uphold their privacy. All panoramic imagery will be processed by our state-of-the-art blurring technology to blur out the faces of any employees or customers who appear in the imagery. At any time, you may request additional blurring or takedown of entire images through our Report a Problem link at either the bottom of the pano image, or within your Place page. You must have the proper authority to allow a Trusted Photographer access to the business premises to collect photographs and to subsequently allow Google to use those photographs in its products and services. People with this authority include the owner of the business or a director or manager with the designation to make those commitments on behalf of the business. Please note that by agreeing to the terms and conditions and the Google Terms of Service before your photo shoot, you are confirming that you have the authority to make that commitment. Yes, you will own the photos taken by Trusted Photographers once you have paid for this service and the shoot is complete. Bear in mind that, by signing the agreement provided by the Trusted Photographer, you will also license the use of the photos to Google who will publish the imagery. Because the technology takes individual unstitched and unreviewed images that need considerable processing after they are uploaded by the photographer in order to produce the attractive “walk-through” experience, you will not be able to review the images before they are uploaded to Google. Yes, if you see a major issue, you can ask us to blur some areas in each of the panoramic images. You may also ask us to take down all panoramas. At this time, we are unable to take down individual panoramas. To request blurring or takedown, click the “Report a Problem” link on the specific images where you see issues and provide the requested information. Please note that the blurring/removal process may take several days. Yes, your photos might be removed if they are found to violate the Google photo policy. Although all business images undergo quality review before being uploaded, some photos may still be reported as inappropriate and later removed. The complete photo policy can be found here. Similar to our policy for Street View imagery, our “Report a Problem” tool enables users to request further blurring of images that feature the user in the 360-degree imagery. Users can also request the removal of images that display inappropriate content, and business owners can ask us to remove 360-degree images taken by Trusted Photographers through the “Report a problem” link or the “Report inappropriate photo” link for feature photos. Yes, we encourage you to share the walk-through experience of your business with your customers. To embed the 360-degree panoramas on your website, simply find the HTML snippet from a good point of view on the panoramic imagery on Google Maps, click the “Link” button, click “customise and preview embedded map”, and then copy and paste the HTML to embed it in your website. If you’re looking for even more customisability with your images, take a look at the Google Maps API. Yes, you are welcome to engage with a Trusted Photographer and coordinate a repeat shoot as often as you like, but it is up to the individual Trusted Photographer to decide the cost. Many businesses that have recently renovated their interiors or that have seasonal decor will request a reshoot. Remember that you can always upload your own up-to-date photographs through Google Places as well.